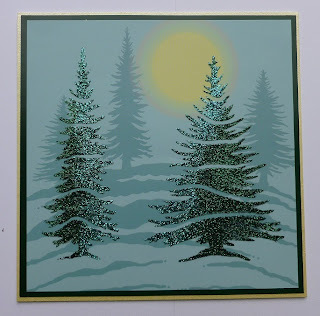 Here is a card I have made using Imagination Crafts Fir Tree Stencil, Fir Tree Background Card and Sparkle Medium in Teal and Hunters Green. 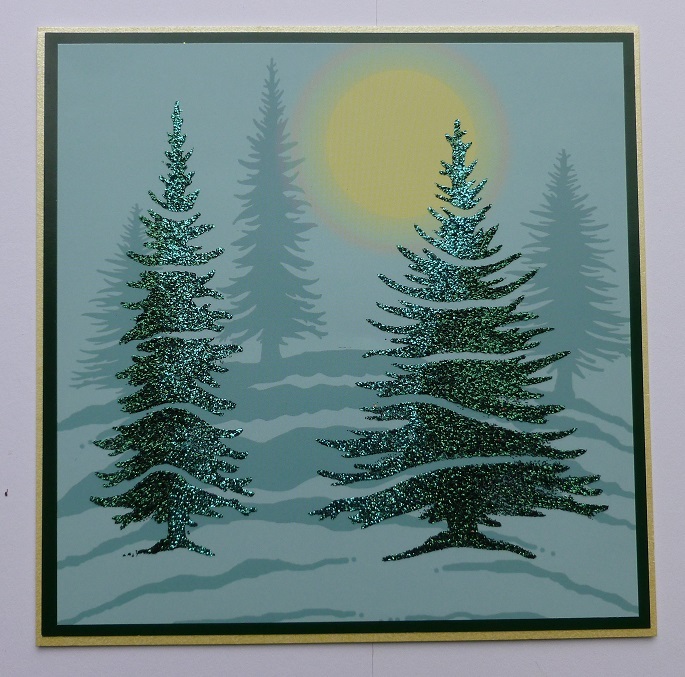 I too the fir trees printed background card and laid the stencil over it and spread the Hunter Green Sparkle Medium over it using the spatula. I then added some of the Teal Sparkle Medium to the edges of the branches where the moonlight shines through the trees. Once this was dry I trimmed around the edges of the card, matt this onto a piece of dark green card then onto yellow card. That is it friends, very easy yet looks effective. 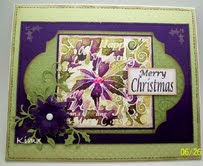 Today we have a card made by Kim! Here is a card that I made using a fabulous Flower Decoupage Stamp from Imagination Craft. 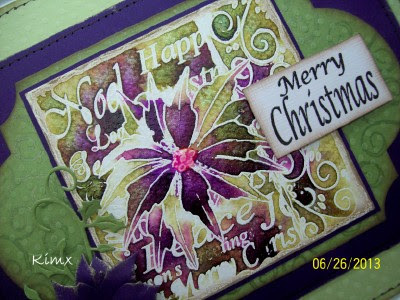 I love these stamp sets as they are so nice to use and they have several co-ordination smaller images as part of the set. And best of all they are very reasonably priced. I think this particular set has to be one of my favourites, but then i am a sucker for Poinsettias. Stamped ones anyway, I always manage to kill the real thing lol. I have coloured this image using a 'Wet Watercolour Technique and the Imagination Vintage Pearly Palette. Unfortunately the photography doesn't do justice to the wonderful pearlescent finish that the paint gives to the image. 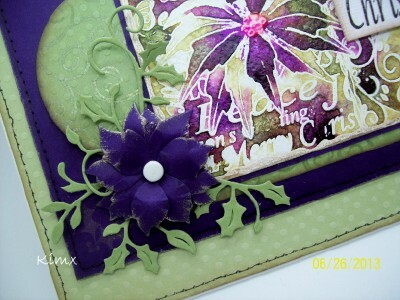 I also used some of the Mica Powders on the green and purple card stock. The finishing touches included some Faux Stitching, a flower and some foliage. I have managed to stay awake most afternoons this week, but I think that Mondays early start if finally catching up with me, so I'm off to bed. I will get around to visiting some of you, but I won't make any promises as to when. So much to do, and so little time to do it in. 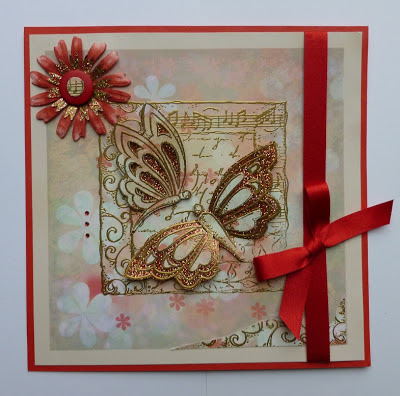 Today's card is made using Imagination Craft's Butterfly Border Decoupage Stamp, the daisy background card. 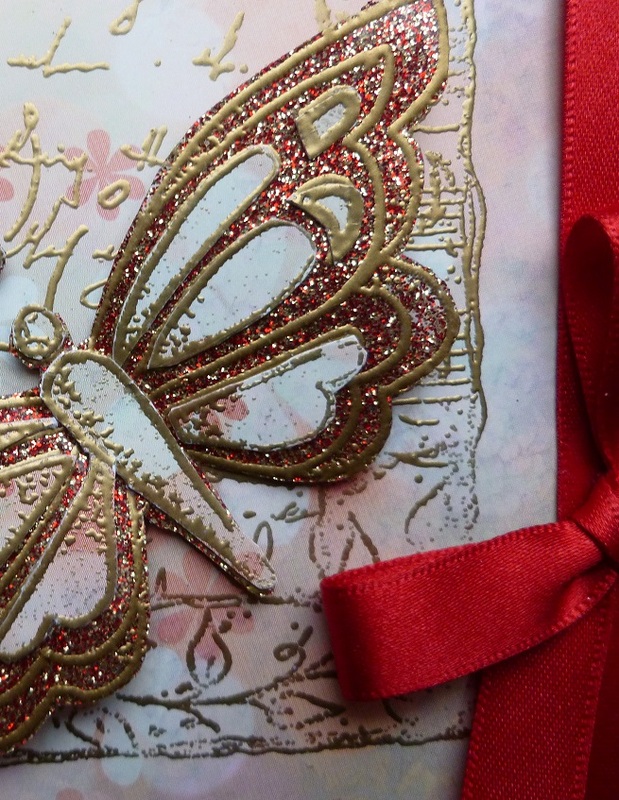 I stamped the butterfly image onto the card using Versamark and heat embossed using gold embossing powder. I then stamped the butterflies onto some acetate and heat embossed with gold embossing powder. I then cut them out and covered the reverse of the acetate with Ruby Gold embossing powder. 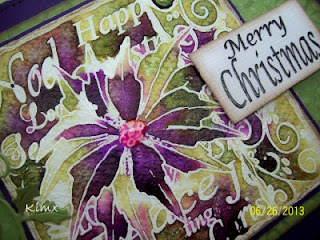 I stamped the butteflies again this time onto a piece of the Daisy background card. Cut out the inner sections of the open - winged butterfly and glued in position on the acetate butterfly. For the closed winged butterfly I cut out the outer sections and glued that onto the acetate butterfly, I then adhered these with silicone glue. 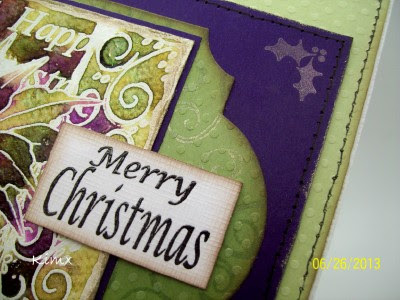 I glued a piece of the left over stamped scroll border to the bottom right hand corner. Added some red ribbon and a bow with three red rhinestones. 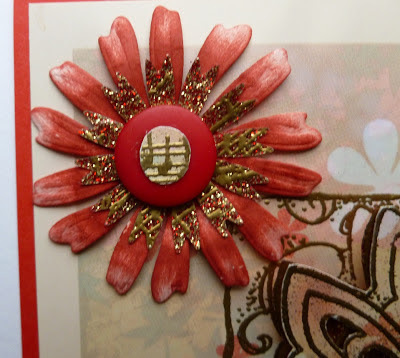 The flower is die cut from white card and coloured with distress ink, punched out a cornflower using some of the left over acetate which was covered with sparkle medium and glued tot he larger flower and added a button to the centre.